Let’s face it, last week wasn’t quite as quiet as I would have hoped for, but there really doesn’t seem to be any point to delay 4.20 because everybody is already taking a break. And it’s not like there are any known issues, it’s just that the shortlog below is a bit longer than I would have wished for. Nothing screams “oh, that’s scary”, though. And as part of the “everybody is already taking a break”, I can happily report that I already have quite a few early pull requests in my inbox. I encouraged people to get it over and done with, so that people can just relax over the year-end holidays. In fact, I probably won’t start pulling for a couple of days, but otherwise let’s just try to keep to the normal merge window schedule, even if most people hopefully won’t even be back until over the merge window is over. As to the details of this last week of 4.20 – most of it is networking (drivers, core networking fixes, bpf). There’s a few other non-network driver updates too, and a revert series of some of the x86 inline asm changes that were obviated by upcoming compiler support. Intel DRM driver has full PPGTT support for Haswell/Ivy/Valley View hardware. The open-source NVIDIA Nouveau driver has initial HDMI 2.0 support. The NVIDIA Xavier “Tegra194” SoC has initial display support. Intel 2.5G Ethernet support via the new “IGC” driver. File systems improvements, drivers updates, and many other changes. For easy way, there are a few third party tools, e.g., UKTools and Ukuu, make it easy to install the latest Kernel in Ubuntu. Select generic for common system, and lowlatency for a low latency system (e.g. for recording audio), amd64 for 64bit system, i386 for 32bit system, or armhf, arm64, etc for other OS types. Once installed, restart your computer and enjoy! While it was not the largest kernel release every by number of commits, it was larger than the last 3 releases, which is a non-trivial thing to do. After the original -rc1 bumps, things settled down on the code side and it looks like stuff came nicely together to make a solid kernel for everyone to use for a while. And given that this is going to be one of the “Long Term” kernels I end up maintaining for a few years, that’s good news for everyone. A small trickle of good bugfixes came in this week, showing that waiting an extra week was a wise choice. However odds are that linux-next is just bursting so the next -rc1 merge window is going to be bigger than “normal”, if there is such a thing as “normal” for our rate of development. And speaking of development, there’s that other thing that happened this release cycle, that ended up making it such that I’m the one writing this instead of Linus. Allow me the guilty pleasure of taking a few minutes to talk about that…. There are a few third-party tools, e.g., UKTools and Ukuu, make it easy to install the latest Kernel in Ubuntu. as “pending”) and a couple of driver fixes (scsi, networking, i2c). Some other minor random things (arm crypto fix, parisc memory ordering fix). Shortlog appended for the (few) details. just to show that “yes, this can actually happen in theory”). Initial support for the Qualcomm Snapdragon 845 SoC. USB 3.2 and USB Type-C improvements. There a few tools, e.g., UKTools and Ukuu, make it easy to install the latest Kernel in Ubuntu. There’s already a graphical tool called Ukuu which make it easy to install the latest Linux Kernels in Ubuntu and Linux Mint. 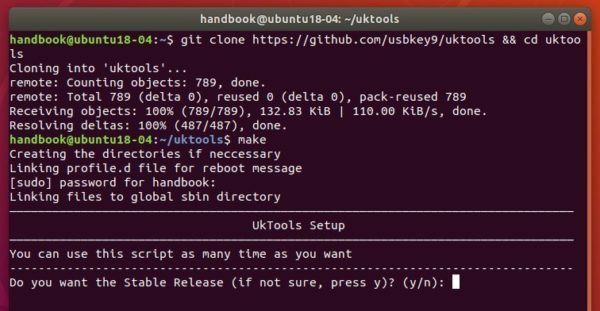 uktools-upgrade, one command to install the latest Linux kernel (stable) from kernel.ubuntu.com. uktools-purge, one command to remove old kernels, the first and the last two are excluded. The tools also support cron jobs to automatically run upgrade and/or purge scripts. NOTE that the mainline kernels are provided by Ubuntu Kernel Team for testing and debugging purposes. They are not supported and are not appropriate for production use. You should only install these if they may fix a critical problem you’re having with the current kernel. Read more about mainline kernels. The application does not has any Ubuntu binary at the moment. However, it’s easy to compile it from the source. The setup runs automatically if it’s installed successfully. So this last week was pretty calm, even if the pattern of most of the stuff coming in on a Friday made it feel less so as the weekend approached. And while I would have liked even less changes, I really didn’t get the feeling that another week would help the release in any way, so here we are, with 4.17 released. No, I didn’t call it 5.0, even though all the git object count numerology was in place for that. It will happen in the not _too_ distant future, and I’m told all the release scripts on kernel.org are ready for it, but I didn’t feel there was any real reason for it. I suspect that around 4.20 – which is I run out of fingers and toes to keep track of minor releases, and thus start getting mightily confused – I’ll switch over. That was what happened for 4.0, after all. As for the actual changes since rc7 – the shortlog is appended – it’s mostly drivers, networking, perf tooling, and a set of nds32 fixes. With some random other stuff thrown in. Again, the shortlog is obviously only the last calm week, the overall changes since 4.16 are much too big to list in that format. The big 4.17 stuff was mentioned in the rc1 email when the merge window closed, but I guess it’s worth repeating how 4.17 is actually a slightly smaller kernel than 4.16, thanks to the removal of a number of effectively dead architectures (blackfin, cris, frv, m32r, metag, mn10300, score, and tile). Obviously all the other changes are much more important, but it’s always nice to see spring cleaning like that. AMDGPU DC enabled by default for the new display code stack. Intel Cannonlake graphics support enabled by default. Improved AMDKFD support for pre-Vega discrete GPUs. And many more other changes. A graphical tool UKUU makes it easy to install the latest Kernels in Ubuntu. For those who don’t want to use any third-party tool, here’s how to manually download and install Kernel 4.17 in Ubuntu (tested in Ubuntu 18.04, though it should work on all current Ubuntu releases). The mainline kernels do not include any Ubuntu-provided drivers or patches. They are not supported and are not appropriate for production use. After installed these .debs, restart and enjoy!